This temple is located about 55 km away from Thiruvananthapuram on the Nagercoil-Kanyakumari highway. 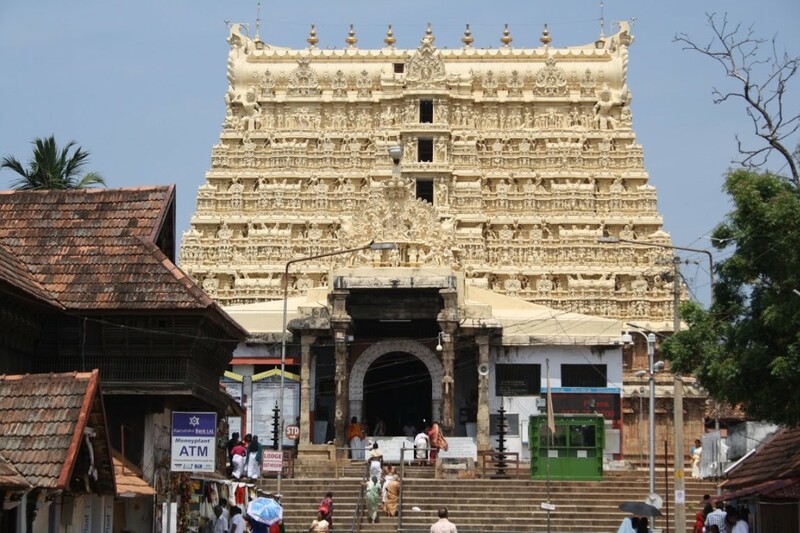 The Padmanabhapuram temple lies on an area of around 7 acres. Long, long ago, Padmanabhapuram was once the capital of the rulers of the old princely state of Travancore or Venad State from the 15th to the 18th centuries. The name refers to the image of the lotus coming from the navel of Vishnu. The palace complex was constructed around 1601 A.D by Iravi Varma Kulasekhara Perumal. Maharaja Anizham Tirunal Marthanda Varma dedicated this palace to Lord Padmanabha and named the palace Sri Padmanabha Perumal Palace. From then on the fort and the surroundings earlier known as Kalkulam came to be known as Padmanabhapuram. Later, the kings, Dharma Raja, to be specific shifted their base to Thiruvananthapuram. Then they began the tradition of bringing deities to the king palace during Navrathri. The temple is adorned with beautiful relics, exquisite wall paintings, intricate rose carvings and sculptured decor. The floors are finished with a high polish which has a special mixture: crushed shells, coconuts, egg-white and juices from local plants. The Queen Mother’s palace has intricate ceiling paintings. The Durbar Hall has a black floor that is very shiny. It is made of a combo of egg white, jaggery, lime, burnt coconut, and river sand. This is a rare Kerala architectural masterpiece. The temple also has secret underground passages. There is also the famous medicinal bed of 64 ayurvedic healing kinds of wood in the King’s bedroom. The festival commences with a procession of idols of goddess Saraswathi taken out from Padmanabhapuram Thevarakattu Saraswathi Amman Temple. The idol of Saraswathi is normally carried to the Padakasala gate of the palace. Here offerings are made by devotees as well as members of the then royal family. The Saraswati Puja is another important festival and is normally observed on the last day of the Navratri celebrations and is celebrated on the same day as ‘Ayudh Puja’. The 10th day or ‘Dussera’ is also included in the celebrations of Saraswati Puja. In the states of Tamil Nadu and Kerala, Saraswati Puja is celebrated on the 9th day (last day of Navratri) whereas in Karnataka and Andhra Pradesh it is observed on the 10th day (Dussehra). The puja begins with ‘Saraswati Avahan’, followed by ‘Saraswati Puja’, on 3rd day ‘Saraswati Balidan’ is done and the ceremonies end with ‘Saraswati Visarjan’. It falls in the months of January-February. One is allowed to visit the palace between 0900hrs and 1700hrs. However, you are not allowed to visit the temple during Mondays and Public holidays.